There is a chain of Filipino bakeries called Red Ribbon and there happens to be one on Colorado. Red Ribbon does serve all sorts of Filipino foods but it's the desserts that I go for. 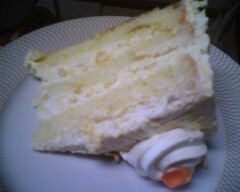 It's lite, not overly sweet, moist, and delicious!! 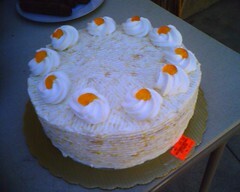 I needed to bring a dessert for a BBQ, so I picked up a Mango Cake and it was a hit. This is one of those archived posts that I should have uploaded last month about Hurry Curry of Tokyo - a little south of Colorado on Fair Oaks Ave in Pasadena. Ummm.... I wasn't really impressed. But the Sake and Sochu cocktail drink menu did catch my attention. They seem to put heavy emphasis on the drink menu. This is a Curry joint with a Happy Hour. I suppose it is a differentiator, but too bad I didn't come in for drinks. I ordered their Chicken Cutlet Curry - which they claim is their most popular. 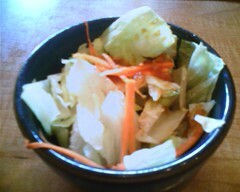 The meal starts out with a standard non-exciting salad. The main dish? I'm not too keen on their plating. 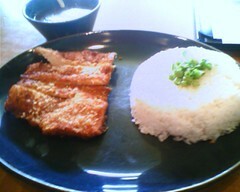 A huge plate with a fried chicken cutlet and a huge mound of rice. The cutlet was fried a little too long and dry. My impression was that the curry was not as sweet as other Curry joints. I liked that. But the dry chicken didn't make for a great experience. Perhaps a side view will provide some more perspective. And points off for no condiments (fukujinzuke, rakkyo...etc.) - unless you ask? I didn't post this earlier because I wanted to go check out the Hurry Curry joint on Sawtelle to see if there was any difference. After all, I was taking a field trip to the West Side to check out the film, Cavite, at the Nuart. (Great indie flick by the way. A thriller made for $7k and filmed mostly in the Philippines!) Getting back to the chow, the experience on the West Side was pretty similar - except the chicken was a little bit better and it was more crowded. I would have been better off going to Blue Marlin or Sawtelle Kitchen. - Hurry Curry is not a destination site for me. I may go again if I'm in the area doing something else and need some Japanese food and drinks. 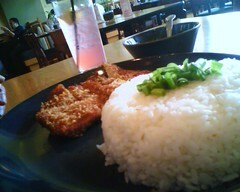 - If you find yourself on the East Side with a hankering for Japanese Curry, go indie with a mom and pop joint - try Ducks on Las Tunas in San Gabriel - their tonkatsu and chicken cutlet is better. Of course when I go to Ducks, I'm known to switch my mind and get their donburi. Today I was cruising down Colorado when I spied on a Hoagie joint on the corner of a strip mall near Sierra Madre. 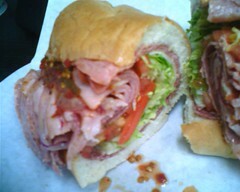 Lee's Hoagie House - I stopped to try a sandwich. I had my share of steak this week so I opted for a coldcut sandwich instead of a cheesesteak. 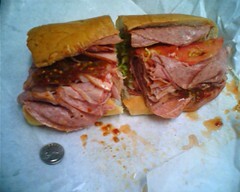 Here I present, Lee's Italian Supreme. I put a quarter on the wrap so you get some perspective. This sandwich was huge - and just a total of $6.22. The joint was totally packed so I took my hoagie to go. The interior is simple and the customers looked like regulars from all walks of life - office workers, cops, and older folks hanging out. I've never been to Philly so I can't comment on the authenticity. I'll let others debate that. All I know is that I enjoyed this sandwich. Here is a view of one half. 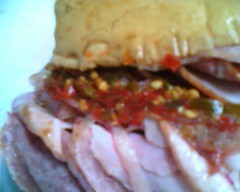 You can see how the sandwich was constructed. One thing though - this is a wet sandwich so it'll get soggy really fast so don't let it sit for too long. Probably best to have it there - if you can get a seat. I'll be sure to go back and try out a Cheesesteak soon.